William Winckler Prod. Tatsunoko Prod. Last I checked, this anime was available on DVD at this online store. 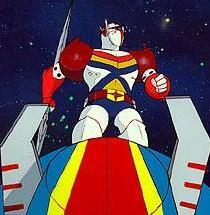 Released in the mid 1980's, Tekkaman the Space Knight received excellent ratings on television in the U.S. and generated lots of positive fan mail. 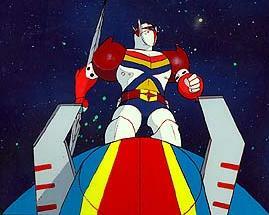 As syndication sales grew, television was suddenly bombarded with toy-driven "robot series" including "Voltron," "The Transformers," "Go-Bots," "Robotech," "Silverhawks," and more. This flood of bartered ("free") programs, all produced by large multi-million dollar corporations, destroyed future sales of Tekkaman (regardless of the good ratings) because at the time William Winckler Productions was a small independent company without a major toy company behind it. Over forty-thousand original Tekkaman the Space Knight VHS video cassettes were successfully sold throughout the U.S. to major retail stores by Congress Video Group (the largest video distributer at the time), and later by L.D. Video. Congress Video sold half-hour episodes, whereas L.D. Video sold the two 96-minute movie compilations. Winckler attempted to stay as true to the original Japanese series as possible, doing as little editing of violence as possible, and leaving all the original Japanese music and sound effects in. This was very unusual at the time, considering how show's like "Gatchaman"/"Battle of the Planets" were handled. In fact, at the time, Ted Turner was considering buying Tekkaman for his giant cable network, but turned the show down due to the heavy battle scenes. The above description came from TATSUNOKO PRODUCTION WORKS GALLERY with information from William Winckler, and was edited by yours truly (contact me).